Our sound designers and creative engineers have been on an epic journey across the fields of Rohan to the great Misty Mountains to discover and create the perfect alchemy of Quest Game. An entirely new collection of game ready audio assets for building your own immersive world of fantasy gameplay, action and adventure. Sound the call of eminent victory with loot crates and treasures chests to reward your players, an empowering allotment of sliding and moving gears and mechanisms, character equipment pickups and placements, menu selects, unlocks, positive rewards and achievements, footstep and foley sound effects on cobblestone road, forest grass, brick walkway, tavern wood floor. The deep selection of ambient background and nature loops, over an hour of sound by themselves, make this collection a powerful tool for completing your project on time and a certifiable best value. 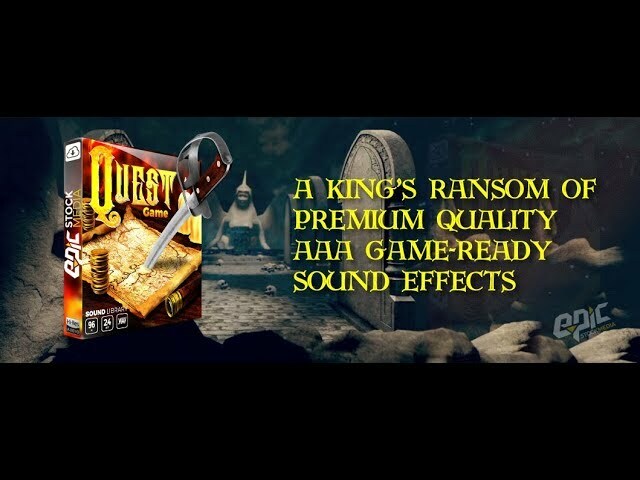 Quest Game – Fantasy Adventure Sound Effects Library is well equipped with undead magic, elemental spell sounds, game action effects like crafting, harvesting, jumps, gear bags, books, and scrolls plus scene setting and environmental sounds for haunted crypts, dungeon wind, undead city, royal chambers and elven outpost custom backgrounds. Level up your audio production empire with Quest Game. A complete sound effects kit for any action adventure, fantasy magic sound project. Quest Game is just about everything you need to tell your epic story in sound and completely outfit a full-featured MMO, RPG (Role Playing Game), mobile, app, console or any platform style game. All nature ambiences recorded on location in Finland, Tennessee and Illinois USA. Over 6 Months in the making.